Last time we talked about chain links that start out as figure 8s, and I said that my next area of focus would be on a capital letter B. Before I do that I want to share a picture of some links that I couldn’t find last week in time for the blog. These were purchased from an old collection of metal detector finds from the Balkans. They are supposed to be Medieval, which is plausible. The most poorly crafted chain in the batch is actually the forth down from the top. The links look like they were cut with a chisel (there is at least one double strike) and no attempt was made to make the ends of the links square. It reminds us that not all “old” craftsmanship was good (but that is still no excuse for lousy modern craftsmanship). I admit that another week of research on the topic of link forms has changed my mind a little. I have talked about this before. One of the dangers of continuing to do research in digital archives all over Europe, while writing blogs, is that sometimes you change your mind. A thing is not exactly what you thought it was. So in this case “B” is for bent. Now “bent” may seem a bit obtuse, but imagine that you have made half of one of those last figure eight links that we talked about, and then instead of making the other half, you simply bent the remaining wire down in a gentle arch until it reached the bottom end of the formed bottom of the eight… confused? Here is a photo of some links to clarify. The top picture shows the links from straight down, and the bottom picture shows them from the side so that you can see how 3D they are. The figure eight link is the one that I mentioned. The link to the right of that shows what I mean by only making half of the figure 8, then the middle link shows the beginning of the bending process, and the forth link from the left shows the completed link. The link all the way to the right is the same link form flipped on to its side so that you can see the half circle clearly. Better? Take a look at the chains on this chatelaine at the British Museum. This 7th century Merovingian piece has three identical chains hanging from it. But if you look at the last link on the bottom of the center chain you can see exactly the form that I am talking about. It is half of an eight with the other end of the wire bent to form a half circle. Now I think that this link form was one of the ones that really confused me when I first looked at it about five or six years ago. So I went in search of other similar links in other areas of Europe. I like to see how pervasive a form is, and how long we seem to find the form. Is it a local fad, or do we find it in a lot of places? 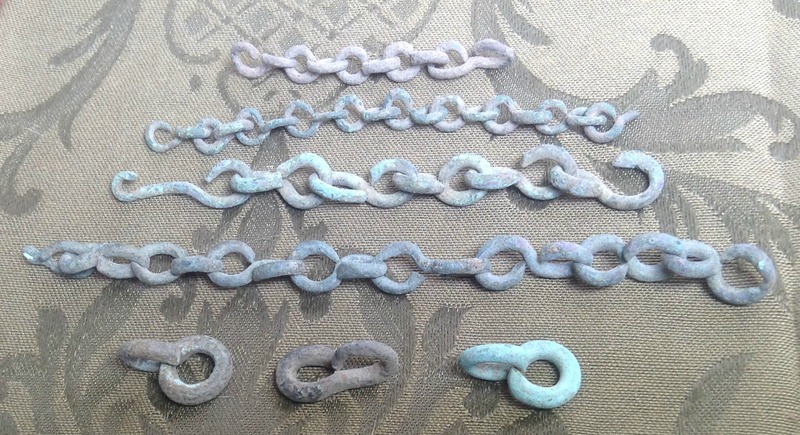 I found several chains with the ‘bent” links in the Swedish National Museum, four from Gotland and one from Öland, and all from the Viking Age. I was trying to locate the museum’s technical definition of the Viking Age, since not everyone uses the same exact dates, but I couldn’t find it, so we will go with A.D. 793–1066. This picture has three pieces of chain, from the island of Gotland. If you click on the small picture it will bring up a bigger one. 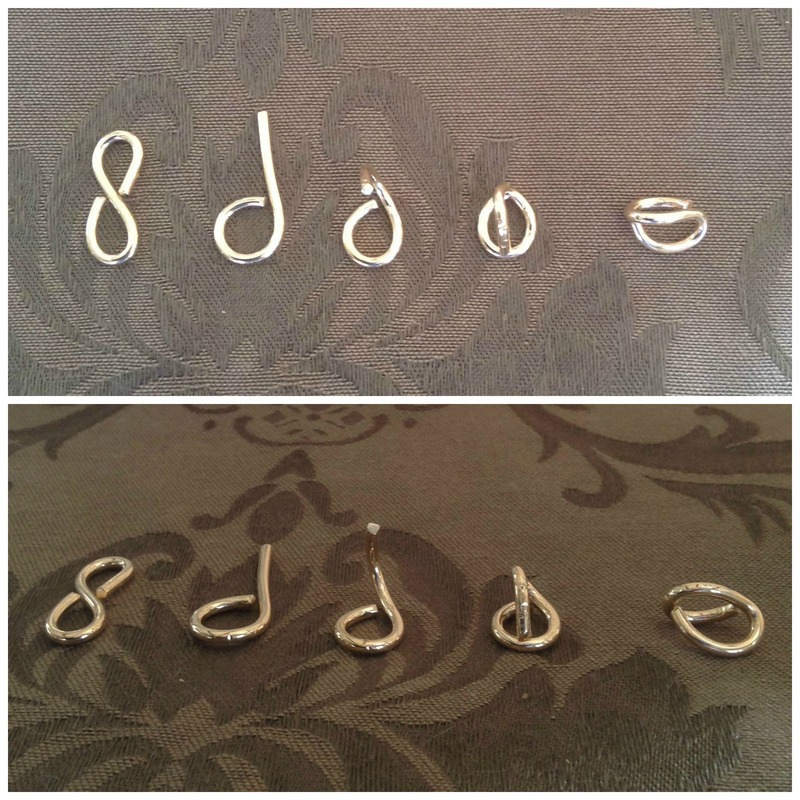 The top piece is a simple two in one link pattern, but the bottom two are both the “bent” links. The middle chain is particularly nice because the last two links on the left side are both slightly open, which allows you to see exactly how they were formed and put together. I was still looking for a few more examples from other places in Europe, I am sure that there are more, it is just a matter of spending enough hours going through digital archives. At the last minute I found this piece from Germany in the Metropolitan Museum of Art. It is a Censor for burning incense, dating to the 12th Century. This close-up shows the form of the links really nicely. And Next Time: A couple of other unusual, but not uncommon, link forms. This entry was posted in Dress Accessories, Metal Working and tagged chain links, chains, medieval chains, Viking chains by Eirny. Bookmark the permalink.